Join us from 2-7pm Sunday July 26 for an in depth profile of the violin playing of jazz musician Ray Nance hosted by Charles Iselin. Though Nance was known for his range of talents as a trumpeter, cornetist, violinist, singer and dancer, this show will focus exclusively on Nance’s violin work. Originally from Chicago, Nance started playing violin at the age of 9 and was so proficient by the time he was 14 that he enrolled at the Chicago College of Music. Nance played in the bands of Horace Henderson and Earl Hines, but rose to world fame when he joined Duke Ellington in 1940, playing his first performance with the band at the well-known Fargo, ND concert. He came into the band as Cootie Williams’ replacement and was mainly featured as a member of the trumpet section. However, Ellington’s developing interest in the individuality of his musicians in the 1940s made this orchestra the ideal place for Nance to develop his proficiency on the violin. 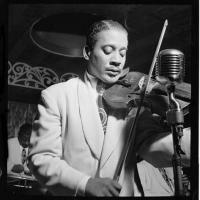 Though not the first jazz violinist, Nance was able to forge an individual style quite distinct from those of his predecessors. With this style he became an integral part of the Blanton-Webster Band and beyond. We will examine his career with and without Ellington, from the early 1940s to his departure from the band in 1963 (after Cootie Williams’ return), and onwards to his death in 1976.